Last night at the Buffalo Philharmonic Orchestra I got to hear the pianist Juho Pohjonen playing the Grieg Piano Concerto. Look at me, I could type Juho Pohjonen without checking it. And I am pretty sure I am right. Not only that but last night I could type Eliel and Eero Saarinen without checking it! They are the Finnish architects of Kleinhans Music Hall. You know you are a true Buffalonian when you can type Eliel and Eero Saarinen without checking it. Juho Pohjonen is also Finnish. Here in Buffalo we are in the middle of a celebration of Finnish culture. I love the Finns, I must say that. You picture them up in the frozen North with their umlauts and their wild language. In Buffalo we had Outokumpu American Brass. I think that is how you spelled it. I remember asking my mother, What is "Outokumpu," is it Indian or something? And she said no, it was Finnish. My mother always knew everything! 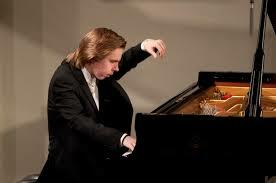 Anyway Mr. Pohjonen, pictured above, played the daylights out of the Grieg Concerto as I wrote in my review. What a wonderful concerto. Writing about Leonard Pennario I think about it a lot because Pennario learned it when he was 12, in a week, and performed it from memory with the Dallas Symphony Orchestra. You go, Pennario! One thing I loved about Juho Pohjonen's performance was that afterwards he played a piece by Grieg called "Bridal Procession." I love these salon pieces. I say bring back these salon pieces by Grieg, by Edward MacDowell, by other composers we do not hear as much now as people used to 100 years ago. Here is Grieg himself playing "Bridal Procession." It is actually "Norwegian Bridal Procession."